Harlequins fly-half Nick Evans has signed a new contract with the club. 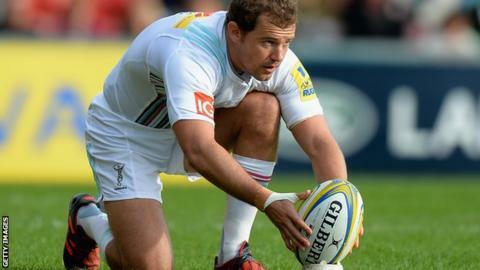 The 35-year-old former New Zealand international joined Quins in 2008 and has scored 2,024 points in 181 appearances for the Premiership club. "Nick is the consummate professional and his competitiveness still burns more than it ever has," said director of rugby Conor O'Shea. "He is a massive influence on the group and he has become a true legend in the history of Harlequins." The club have not disclosed the length of Evans' new deal at the Twickenham Stoop. Evans, who won 16 caps for the All Blacks between 2004 and 2007, helped Quins win the Amlin Challenge Cup in 2011 and the Premiership title a year later. He became the club's leading points scorer in 2013, surpassing Bob Hiller, and is fifth on the all-time list of top points scorers in the Premiership. "Harlequins has been the biggest part of my professional career and I am so proud to have been given the opportunity to continue at this great club," he said. "The potential this group of players has is incredibly exciting. I'm looking forward to being able to help the squad reach our domestic and European goals once again."